International policy with the buckling Soviet Union was a critical component of the political landscape in the late 1980s. Vice President Bush can be seen here standing with United States President Ronald Reagan and Soviet General Secretary Mikhail Gorbachev, on the New York waterfront, 1988. The 1988 United States presidential election in New York took place on November 8, 1988, as part of the 1988 United States presidential election. Voters chose thirty-six representatives, or electors to the Electoral College, who voted for president and vice president. New York was won by Democratic Governor Michael Dukakis of Massachusetts with 51.62% of the popular vote over Republican Vice President George H.W. 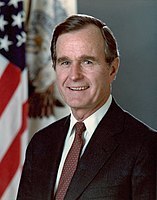 Bush of Texas, who took 47.52%, a victory margin of 4.10%. 1988 would mark the end of an era in New York's political history. Since the 1940s, New York had been a Democratic-leaning swing state, usually voting Democratic in close elections, but often by small margins. Republicans would dominate much of upstate New York and populated suburban counties like Nassau County, Suffolk County, and Westchester County. However they would be narrowly outvoted statewide by the fiercely Democratic and massively populated New York City area, along with some upstate cities like Buffalo, Albany, and the college town of Ithaca. This pattern would endure in 1988 for the final time, allowing Bush to keep the race fairly close, only losing the state to Dukakis by 4 percentage points. As a result, 1988 was the last time in the states history that New York was considered a swing state. Dukakis’ statewide victory is largely attributable to winning the five boroughs of New York City overall with 66.2 percent of the vote. However even though losing the city in a landslide, Bush’s 32.8% of the vote was a relatively respectable showing for a Republican in NYC, particularly in retrospect. In the six elections that have followed 1988, Republican presidential candidates have received only seventeen to twenty-four percent of the vote in New York City. This was the last election in which a Republican presidential nominee won heavily populated Nassau and Westchester Counties, as well as Monroe, Onondaga, and Ulster Counties, and also the last election in which New York was decided by a single-digit margin. Beginning in 1992, the Democrats would make substantial inroads in the suburbs around New York City as well as parts of upstate, making New York a solid blue state that has gone Democratic by double-digit margins in every election since. ^ "1988 Presidential General Election Results - New York". U.S. Election Atlas. Retrieved 13 October 2012. This page was last edited on 17 January 2019, at 17:50 (UTC).